I've been meaning to write this review for awhile, but life has been keeping me pretty busy lately. In fact, while I'd like to have spent more time playing this game, I haven't had much opportunity -- or energy -- of late. 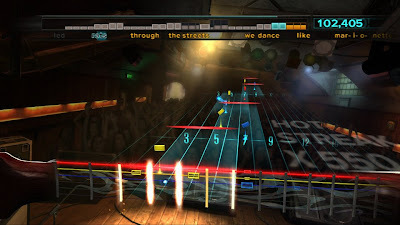 Rocksmith allows you to plug a real guitar into your PS3 or (in my case) Xbox 360 and play along to real songs (using a special cable included with the game -- plug one end into the guitar, the other into your gaming console). It adjusts the difficulty up or down depending on your skill (or lack thereof!) and no matter how badly you do, you can't fail out of a song as in games like Rock Band or Guitar Hero. I've recently run across an exception that occurs while trying to update Entity Framework data models from their respective databases. The exception message is "Unable to generate the model because of the following exception: 'An error occurred while executing the command definition. See the inner exception for details. Undefined column mapping." I searched online and couldn't find any mention of this exception. This surprised me, considering the frequency with which I've been encountering it. I thought that perhaps it had something to do with the DbContext I'm using with Entity Framework 4.1 to create persistence ignorant POCO (plain old CLR object) classes. I tried a few things to alleviate the issue, but to no avail. I recently made use of a Devart Entity Model to allow me to use LINQ with an Oracle database and to get around an issue when using views with Entity Framework 4.1. Everything worked well...until the code was deployed. When running on my local PC (either through Visual Studio or from another site under my local IIS) the code worked without a problem. But when built using our build machine, I would receive the "Unable to load the specified metadata resource" exception when trying to call a service method that made use of the entity model. When I used IL DASM (ildasm.exe) to examine the manifests of the assembly built locally versus the one built on the build machine, I found that, indeed, the resources for the Devart Entity Model were not present in the assembly manifest of the assembly that was built on the build machine. Awhile ago, I was having issues adding a WCF service reference to a project I was working on. I was getting an error when trying to add the reference that said “Custom tool error: Failed to generate code for the service reference”. Looking at the Reference.cs file for the service, it was blank except for the comment block at the top. It's been a few months since I've written anything here. Things have been extremely hectic, and any downtime has usually been spent trying to relax and recharge. In fact, I haven't had time to think about what to write here, so this blog entry will be a hodge-podge of miscellaneous thoughts and updates. I've been playing the new Mortal Kombat game. When I heard it would be moving back to a 2D fighting plane, and doing a "Let's go back in time and have an alternate history of the first three games (a la the latest Star Trek film)", I had absolutely no interest. But the pulled it off very well. Yes, I do miss the strategy and depth allowed by a 3D plane, and miss the multiple fighting styles that the characters have had in the last 3 games, but what's there is really good, and I love the addition of a 2-Player tag team co-op mode -- my son and I enjoy playing this together. In the above example, numberOfColumns is declared as an int. I thought that, because I was assigning the result to a double, I would get a fractional number if numberOfColumns divided by 2 was not a whole number. However, what was happening was that the fraction was being dropped. ReSharper was also giving me a warning message, "possible loss of fraction". Even though I'd been on a bit of a Star Trek kick lately, I happened across this by chance -- a friend shared it with another friend on Facebook, and it showed up in the "Most Recent" section of the main page. When I first saw the post I thought it was a video with the theatrical track, which is a nice instrumental, but that's not what this is. I guess this was the single version (yes, they released a single version). Oh dear. I'm glad I decided to click "Play" before assuming it was the theatrical version and commenting with "I love this track". Oh, the humanity. I've been on a bit of a Star Trek kick lately, and on my drive in this morning I was considering writing a bit about it here on my blog. And then I learned that today is William Shatner's 80th birthday, so that pretty much convinced me that it had to be done. I'll be writing in more depth a bit later, but for now, here is a video by Maurice LeMarche, a voiceover actor (along with one of his Futurama cast mates), instructing us all on the intricacies of sounding like William Shatner. Enjoy! Found On The Web: Hello? Classic Comic Series: What If? Lately I've been on an old comic book kick, reading a lot of old issues from the 60s, as well as some from the 70s and 80s. I don't care at all for the current state of comic books, but I love the old stuff. 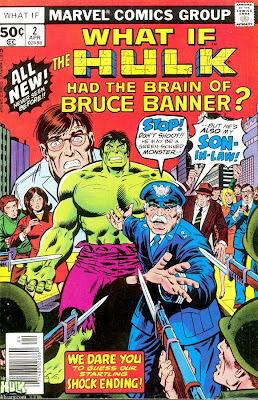 Recently I read the 2nd issue of Marvel's What If? series. This series would take an alternate history approach by proposing what would happen if certain key moments in the Marvel Universe had occurred differently, or if a character had been different in some way. They brought the series back a few times, but it's the original issues from the late 70s to mid 80s that I enjoy the most. I have long been a fan of that which is unintentionally funny, but before I go any further, let me state, with absolute seriousness, that there is more to this album than that. I'd heard the stories. 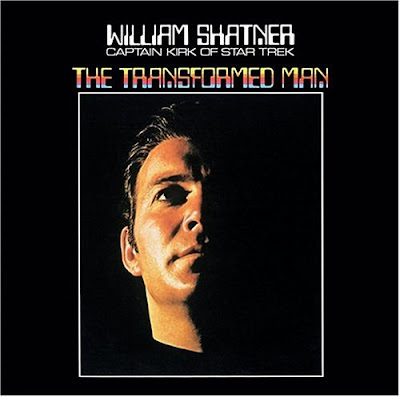 The reputation of this album, and in-particular, Mr. Shatner's renditions of Mister Tambourine Man and Lucy In The Sky With Diamonds, proceeded itself. My first real exposure to it was when I was about 20 and found a copy of it on CD, paired with a slightly-truncated copy of Leonard Nimoy's Two Sides of Leonard Nimoy on the same disc, at my local indie music store. I was ecstatic and bought it immediately. Turns out, unbeknownst to me at the time, it was a bootleg -- mastered off of vinyl records no less! But despite the not-so-great quality, it delivered. There's something to be said for the simple things in life. As life becomes more hectic and complicated, I find myself looking for those simple things to find solace and relaxation in. When I need to wind down, I like to have something simple to find some enjoyment in. The taoist book "Tao Te Ching" mentions teachers who "teach without teaching", and during my early twenties, I had two friends, Ed and Rob, who did just that. From them, I learned an appreciation for the simple things in life, not through anything they said or told me, but through their example. I soon learned to appreciate the simple things myself, and from time to time (when I have time), I put this to practice to take a break from all the commotion in life. I posted a few weeks ago about a problem I had with the Microsoft SYNC system in my car not hearing my voice commands. At the time, a simple restart of my car seemed to fix the problem, but since then, the problem got worse and worse until finally not even the Bluetooth pairing to my phone would work. This was extremely frustrating considering I'd owned the car just over a month at the time. Thank you for your order from www.starwarsshop.com. I recently purchased a new car, the first I've had in 14 years. My previous car had reached the end, and I had no choice but to buy a new one. While I didn't get anything too fancy -- I didn't get a luxury car, or a sports car, or anything like that -- the new car does have Microsoft Sync, which allows you to do a bunch of neat stuff like sync up your cell phone via Bluetooth so you can dial and talk hands free, and do other things via voice commands. The voice command stuff usually works pretty good, but not always, and yesterday, I ran into a definite glitch: it wasn't recognizing any voice commands. At first, I was trying to use some of the stuff that I hadn't used before, but every time I issued a command, the Sync would sound the tone that means "I didn't understand that." Ironically, when it would offer suggestions on what I should say, I found it offering up the very same command I was trying to give it. Here's an interview with writer Harlan Ellison. It's actually the 3rd part of a longer interview, but it's this last part of the whole interview that I really liked. I can't say that I've read much of his work -- in fact, I've only read one of his books, and am still in the process of reading it. He's got a reputation for being arrogant, abrasive, and angry -- yet I find a lot of wisdom in what he says, and in some strange way, comfort. Okay, so this is a little late, but still funny.